Have you ever wondered “how do I renew my passport?” or “when is the best time to renew my passport?” If your US passport is expired or will expire within the next 6-7 months, now is the time to renew it! If your passport is expired, you have 5 years from the date of expiration to renew it without going through the new passport procedure. All the information you’ll need to renew your US passport is below, including eligibility, required documents and a step-by-step procedure for renewing a passport. Get your Passport Renewal in as little as 24 Hours! Click Here to Renew your Expired Passport! Your passport must be in your possession. If your passport was lost or stolen, you can’t renew it, but you can replace it. Your passport must be in good shape. Badly damaged passports can’t be renewed, either. You’ll need to apply for a mutilated passport replacement instead. You must have been at least 16 years old when your last passport was issued. The passport renewal process isn’t used for minor passports. Children who are still under 16 will have to apply for another minor passport, which will be valid for 5 years. If you turned 16 since your last passport was issued, you can apply for your first adult passport. Your passport can’t be more than five years expired. Don’t wait too long to renew your passport! You should apply for a passport renewal if your passport is expiring or has recently expired. You must renew your passport within 5 years of the date it expired. If you wait longer than that, you’ll have to use the same procedure as a first-time passport applicant. Your passport is low on blank visa pages. You have legally changed your name and your passport was issued more than one year ago. Your passport is showing signs of wear such as curled edges of pages. Your appearance has changed dramatically since your passport was issued, such as due to extreme weight loss. Renewing a passport is easy! It is a much simpler process than getting your first passport, or replacing your passport if it is lost or damaged. 1 Gather all documents required to renew a US passport. 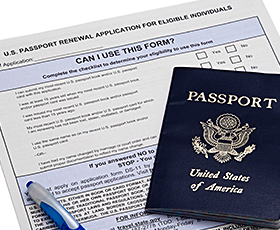 Passport Renewal Application Form (DS-82), completed offline or filled out online at https://pptform.state.gov/ and printed. Proof of name change, if you have legally changed your name since your last passport was issued. By Mail – You can mail in your US passport renewal to be processed at the National Passport Center. At a Passport Agency – If you are in a rush, you can visit US Passport Agencies located in major US cities, where your passport renewal will be processed on-site. By a Passport Expediting Company – If you need an expedited passport renewal, you can send your documents to a reputable passport expediting company, who will hand-carry your application to a Passport Agency to renew your passport fast. Applying for a passport renewal by mail will take up to 8 weeks. Expedited passport renewals by mail cost an additional $60 in government fees and take 2-3 weeks to process. To renew your passport fast, you can either go to a Passport Agency in person or use the services of a passport expediting company. If you want to apply in person, you will need to call the National Passport Information Center at 877-487-2778 to make an appointment to go to one of the 26 Passport Agencies nationwide. Passport expediting companies can get you an expedited passport renewal in as little as 24 hours, without you having to make an appointment or appear in person.